I said I’d be back after the holidays, and I didn’t lie … I just wasn’t counting on coming back so many days after the holidays! I’ve been sleeping until 10:30 like every day then doing ABSOLUTELY NOTHING afterwards. It has been AMAZING. I figure I’ll get some sleep before I have to go back to school. Seven more days! In some very super important news: I got a Magic Bullet for Christmas! 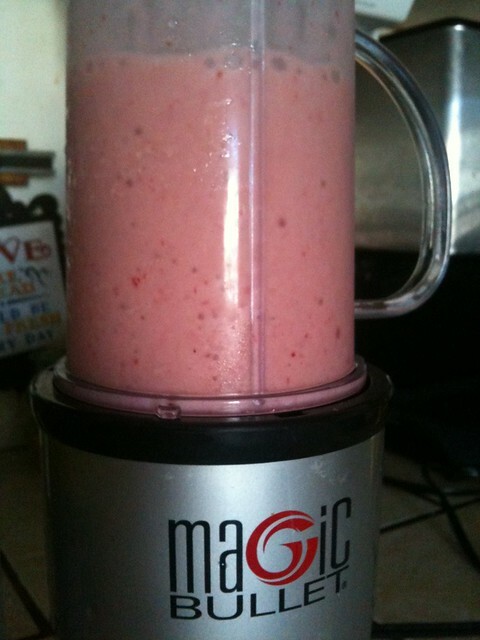 So for my 10:30 breakfast every morning I have been making Magic Smoothies. These are super simple and a great way to sneak in all the fruits (and veggies!) you need for the day. With prep, it probably takes about 5 minutes to make one of these healthy wonders. Add ice and blend it again! Supah easy and supah yummy!